Though use of electronic devices is increased excessively but still people want the energy boost in small size devices. By keeping this wish in mind Nitecore introduce a Tiney Monster Tm 26, worlds powerful flashlight which is also the worlds smallest torch because of size with respect to its power. Tm 26 is 142 mm long with a hard ionized aluminium body. 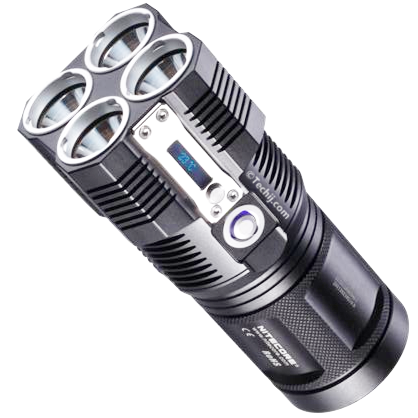 In Tiny Monster TM 26 four CREE XM-L LED are used protected by mineral glass lenses and powered by either four 18650 Lithium ions or via eight CR 123 rechargeable batteries. You can recharge these batteries by connecting AC Adaptor to charging port. The maximum light output from TM 26 is 3500 Lumen, but you can decrease or control it by switching to eight fixed light levels. The flashligh has only one multi pupose switch button by which you can switch to light modes likley general lighting mode, etc, to switch off and switch on, do double click for flashing modes, etc. The torch also have LED Display to show light level in lumens, standby voltage of battery, battery meter, how much run time is left and the temperature of light in Celsius. Four 18650 Lithium ion rechargeable batteries can give output of 3500 lumen upto 45 minutes and in case for normal use of 3 Lumen these batteries can run upto 1000 hours. Tiny monster TM 26 is water proof and its maximum light range output is 1362 feet. The price of ultra bright LED flashlisht Tiny Monster TM 26 is only 390 USD.